Scientists using New Horizons images of Pluto’s surface to make 3-D topographic maps have discovered that two of Pluto’s mountains, informally named Wright Mons and Piccard Mons, could possibly be ice volcanoes. The color is shown to depict changes in elevation, with blue indicating lower terrain and brown showing higher elevation; green terrains are at intermediate heights. 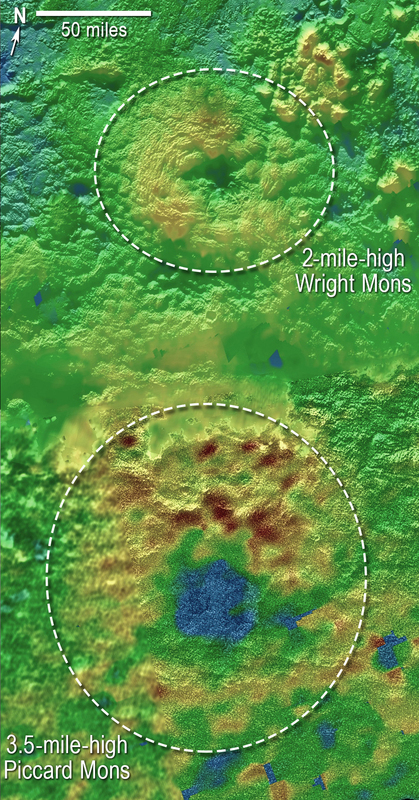 The informally named feature Wright Mons, located south of Sputnik Planum on Pluto, is an unusual feature that’s about 100 miles (160 kilometers) wide and 13,000 feet (4 kilometers) high. It displays a summit depression (visible in the center of the image) that's approximately 35 miles (56 kilometers) across, with a distinctive hummocky texture on its sides. The rim of the summit depression also shows concentric fracturing. 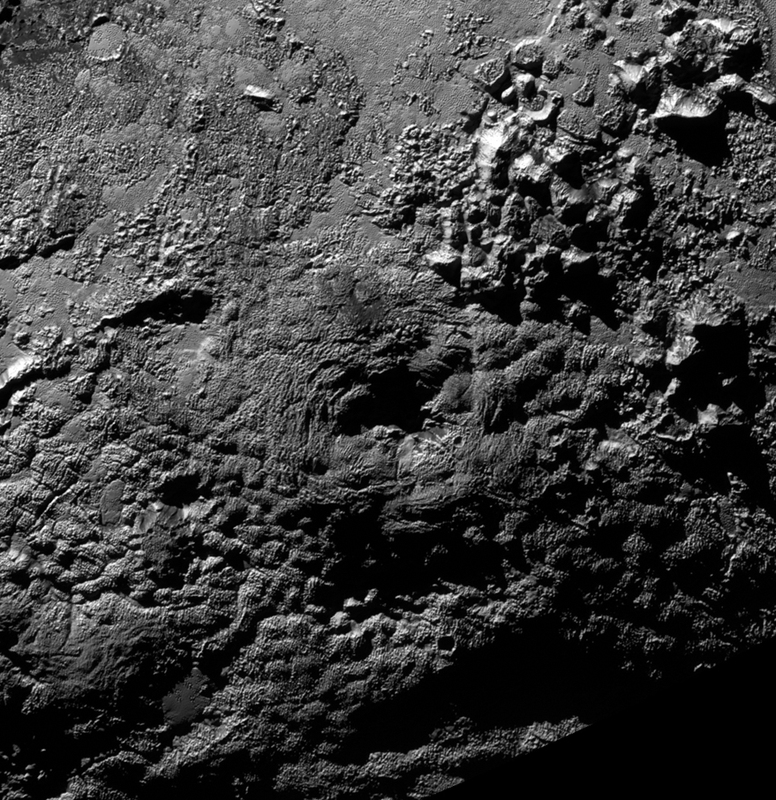 New Horizons scientists believe that this mountain and another, Piccard Mons, could have been formed by the 'cryovolcanic' eruption of ices from beneath Pluto's surface. View the graphics from the Nov. 9 New Horizons media briefing at the 2015 AAS Division for Planetary Sciences Meeting. Scientists wondered if Sputnik Planum’s smooth, icy plains were an oddity; did a recent geological episode form the plains long after all other geologic activity ceased? Locations of more than 1,000 craters mapped on Pluto by NASA’s New Horizons mission indicate a wide range of surface ages, which likely means that Pluto has been geologically active throughout its history. Most inner moons in the solar system keep one face pointed toward their central planet; this animation shows that certainly isn’t the case with the small moons of Pluto, which behave like spinning tops. 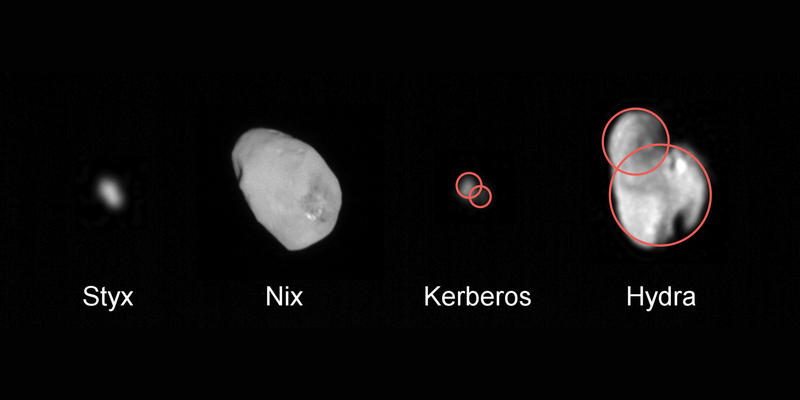 Pluto is shown at center with, in order, from smaller to wider orbit: Charon, Styx, Nix, Kerberos and Hydra. For more information on the New Horizons mission, including fact sheets, video and images, visit http://www.nasa.gov/newhorizons and http://pluto.jhuapl.edu.